A chance encounter with ‘Naked Steve’ started it all off. In his introductions at an ‘Arty Party’ he explained that a few weeks ago he’d been on an obstacle course style TV show and won £10,000. Later that even (slightly drunk) I looked up the show, which happened to be Total Wipeout and announced at work the next day that I was going to apply to be a contestant. ‘Yes, yes’, humoured my boss thinking it was just another hare-brained idea. ..Until I got a rather random phonecall from Endemol on behalf of Total Wipeout asking me some questions. Before I knew it, I was auditioning in a Leisure Centre near South Ken wearing bright pink leggings, leg-warmers and slightly odd hair with several hundred other freaks. The most scary part was suddenly finding myself hanging off some monkey bars opposite another girl who was offhandedly doing pull-ups. I was struggling to manage one. This Total Wipeout business was hard work! The next thing I knew, I was flying out on a plane with 19 other contestants and some bubbly Total Wipeout Crew on a ridiculously long journey to Buenas Aires. It was an absolutely crazy crazy couple of days. 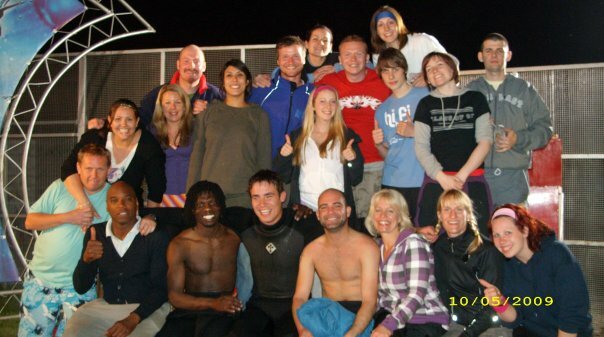 Group shot of Total Wipeout friends from Series 2, Episode 8 (in no particular order): Emma Whale, Julian Harris, Lucy Ruffinato, Donovan Smooth Simpson, Eliza Flynn, James Scott, Carole Jaszewski, Victoria Black, Carl McMurtry, Dave Street, Joe Mitchell, Charlotte Amanda Fisher, Jonathan Everett Turley and Jodie Clip-clop Snowdon Meskimmon.